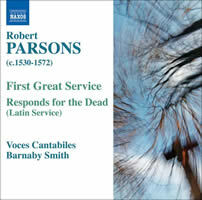 Robert PARSONS: Magnificat; First Great Service (excerpts, 1558-9); Responds for the Dead; Ave Maria (1568?). Voces Cantabiles, Barnaby Smith (dir.). Naxos 8.570451. Distributed in the US by Naxos (http://www.naxos.com/). 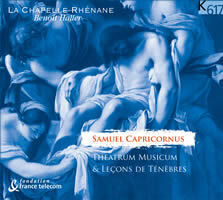 Samuel CAPRICORNUS: Theatrum musicum (excerpts, pub. 1669); Lieder von dem Leyden und Tode Jesu (1660). La Chapelle Rhénane: Tanya Aspelmeier (sop), Barbara Ostertag (mez-sop), Jean-François Lombard (cntrten), Benoît Haller (ten), Benoît Arnould (bs); Rebeka Rusó, Barbara Leitherer, Silvia Tecardi, Jakob David Rattinger, Armin Bereuter (viols), Margret Köll (hp), Andreas Arend (theorbo), Sébastien Wonner (org); Haller (dir.). K617 K617188 (http://www.cd-baroque.com/). Distributed in the US by Harmonia Mundi (http://www.harmoniamundi.com/). Capricornus (1628-1665) adds Carissimi’s dramatic strokes to Schütz’s enforced austerity — rapid “cutting” and artful juxtaposition lend his slight forces the illusion of weight. (In spots the two sopranos of Lieder could pass for a chorus.) With such bare scores, hesitation would be fatal, but tenor Haller leads performances of rare momentum. A viol quartet stands tall, and the harp-theorbo-organ continuo pushes the assured singers. Well worth a detour on the road to Biber and Bach. Svend NIELSEN: Sommerfugledalen (Butterfly Valley), A Requiem (1998-2004). Ars Nova Copenhagen, Tamás Vetö (cond.). Dacapo 8.224706 (http://www.dacapo-records.dk/). Distributed in the US by Naxos (http://www.naxos.com/). Inger Christensen’s cycle may appear too self-contained for a musical treatment. Each sonnet’s opening line is the last line of the preceding one, and the final poem uses first lines of the previous 14. 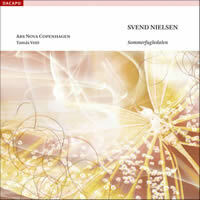 A bonus track with her reading the work shows how subtly composer Nielsen draws on her phrasing; he also produces interlocking patterns of his own. The Ars Nova singers, 12 strong, remain attuned to the unshowy virtuosic demands, as nature imagery turns dark. “Musica del Delphin.” Luys de NARVÁEZ: Los seys libros del Delphín de musica de cifra para tañer vihuela (excerpts, 1538). Pablo Márquez (gtr). ECM New Series 1958 (http://www.ecmrecords.com/). I should get huffy about vihuela music from a modern guitar, but Márquez is a knowing and vibrant guide to this world. The short program (46:12) has many peaks. Fantasias in each of the eight medieval modes contain the harmonic language, with no hint of dry point-making. The Spanish hymn O gloriosa Domina is clearly signposted in its six variations (diferencias), but in dazzlingly inventive contexts. 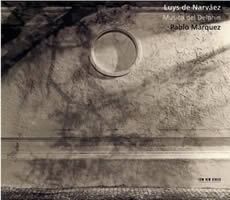 Márquez keeps the frame small and delicate, and ECM’s pellucid recording shines. 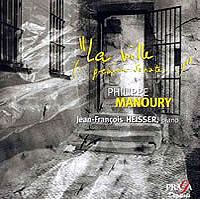 Philippe MANOURY: La ville [… première sonate…] (2002). Jean-François Heisser (pno). Praga Digitals PRD/DSD 250 207 (hybrid multi-channel SACD). Distributed in the US by Harmonia Mundi (http://www.harmoniamundi.com/). A solo-piano “map of an unknown city” (à la Boulez’s Third Sonata) surely intrigues. Here the city is Old Prague, and the 36:22 journey marks “a sort of postlude” to Manoury’s Kafka opera. Anchor points are descending scales in Liszt’s Sonata and Act II of Lulu. The 19 sections occupy six levels, employing fugues, toccatas and “melodic meditations” — always truncated, always returning but different. Heisser makes a formidable advocate, aided by superior sound (plentiful snarl and glint).